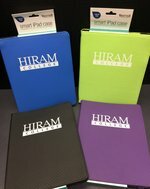 iPad Smart Case w/ Hiram Imprint. Compatible with 2nd, 3rd, and 4th generation iPads. On SALE!